On Arrowsic Island along the Kennebec River on the Boothbay side. You can hike from a path off Bald Head Road from Route 127. Arrowsic was one of the first settlements in New England with more than fifty families by 1670. In 1676, Indians stormed inside the stockade gate and massacred nine of the families. For a while, the Keeper at the Kennebec River Range Light Station was given the added responsibility of tending the Squirrel Point Lighthouse, until it was finally automated in 1979. There were many lawsuits filed in the following years regarding owner’s rights and tenancy, education, conservation and preservation of the site while its buildings started to fall into disrepair. By 2005 all rights, title, and interest in Squirrel Point were put back in the federal government’s hands. In 2008, a 15-year lease was granted to the Chewonki Organization with the contingency to offer environmental education, natural history, conservation, and wilderness programs. Arrowsic is a tiny coastal island village. 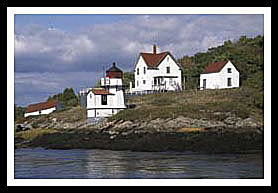 Some of the best views of the lighthouse can be seen from various boat tours that go by the lighthouse from Bath and from Boothbay Harbor. For those of us who want to get a close up view of the lighthouse and surrounding grounds, The lighthouse is less than a mile hike in the woods on relatively level ground on well marked trails.Squirrel Point's five acres are situated amongst 640 acres of conservation land. From the same trail at Bald Head Road mentoned below, you may follow a longer blue markered Nature Conservancy trail to Bald Head. The lighthouse is about a mile hike in the woods on relatively level ground. When you come to a fork stay to the right and stay on the dirt road. Bear left onto Bald Head Road to the end. When you come to a small dirt parking lot, take the first footpath on the right. Now you've got a nice mile or so hike in the woods (bring your insect repellent). Bear left by the tree with signs on it. Stay on the main trail and it will easily lead you to the lighthouse. The views are worth the hike. You can also view the station from across the Kennebec River in Phippsburg. From US Route 1 in Bath, take ME 209 South for six miles. Turn left on Parker Head Road in Phippsburg. After almost half a mile, the lighthouse is visible from a distance across the river. Boat cruises mentioned below may offer many types of cruises. While some may offer specific lighthouse cruises that pass by Squirrel Point Lighthouse, some will pass by the lighthouse as part of charters, narrated wildlife and historic tours, whale watching adventures, fishing tours, and other types of excursions. Chartered pontoon boat for lighthouse excursions. A nice and relaxing way to view lighthouses, natural formations, and wildlife. Offers special lighthouse cruises to Squirrel Island, Monhegan Island and a chance to tour Burnt Island Lighthouse and talk with the keeper. Mackerel fishing tours and sailing trips also promoted. 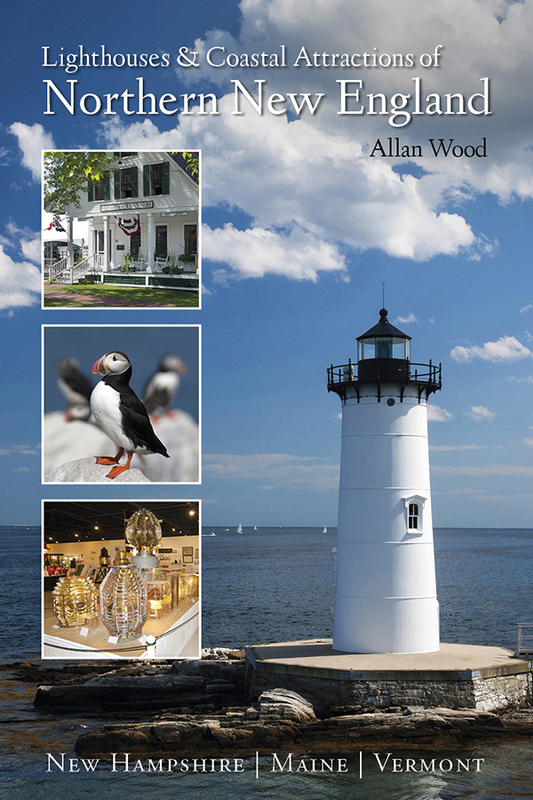 My 300-page book (with over 360 images), Lighthouses and Coastal Attractions of Northern New England: New Hampshire, Maine, and Vermont, provides human interest stories from each of the 76 lighthouses, along with plenty of coastal attractions and tours near each beacon, and contact info to plan your special vacation.